i Click 'view all' to instantly compare this good deal with offers on other top baby monitors. 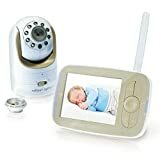 3.5in Video Baby Monitor, Night Vision, Temperature Sensor, 2-Way Talk is currently selling at $89.99, approximately $2.00 lower than average, giving a potential saving of $50.00 right now. With a lowest price of $89.99 and an average of $91.99 it is selling on the low end of its usual range. Price volatility is 1.04% (meaning it does not change often), so the price should stay low for a while. Right now this product is a recommended 'good deal'. The current deal is also the best price on this item over the last month. 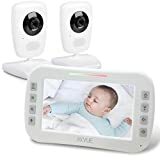 Compare the current price, savings (in dollars & percent) and Buy Ratings for the top Baby Monitors that are closely related to 3.5in Video Baby Monitor, Night Vision, Temperature Sensor, 2-Way Talk. Here is how 3.5in Video Baby Monitor, Night Vision, Temperature Sensor, 2-Way Talk compares with other leading Baby Monitors. About the product Multi Camera? Support Picture Quality: Clear and bright Connection Type: Enhanced 2.4GHz (No Delay) ECO Mode: Power saving with sound activated Rechargeable Battery: 950mAh (10Hr) Room Temperature: YES Two-Way Communication: YES Infrared Night Vision: YES Features: 2 X Magnification: Our baby monitor large screen shows clear video image with incredible visual details of your baby. 4 Built-in Lullabies: Our baby monitor can play lullabies to soothe down your baby, help it fall asleep peacefully and improve its sleep quality. 4 Cameras at Most: One parent unit can connect to 4 baby units at most. Video images of various cameras can be shown on the LCD display at the same time. Long-range Connection: Good connection can be ensured even if you walk around your house. Timer Alarm Clock: The timer clock (2h/4h/6h) can remind you to feed your baby and make sure it eats on time. Voice Prompt: Voice prompt to alert you to low battery or lost connection. Package including: 1.Parent unit x 1 2.Baby unit x 1 3.Parent unit adapter x 1 4.Baby unit adapter x 1 5.User manual x 1 Question and Answer:Does this connect to wifi? No Can you still hear the room sound even when the eco mode cuts the screen off? Yes!Sound still works. It's perfect, and you can regulate how loud you want to be able to hear it. Can you view the video over your phone? NoDoes it work on dual voltage 110/200 (both camera and monitor)? Yes. 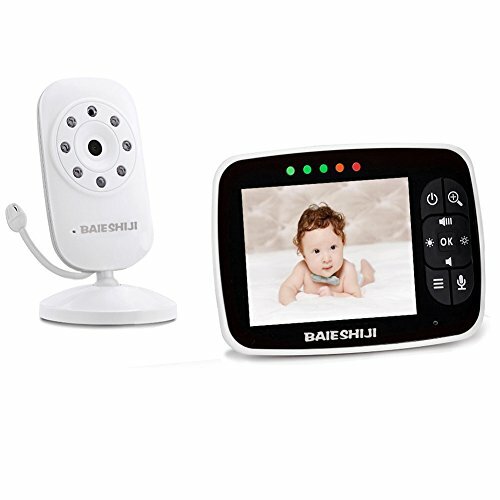 Features3.5-INCH LCD DISPLAY & 2.4 GHz WIRELESS TECHNOLOGY- With a large 3.5-inch color screen and the 2.4 GHz wireless technology, our smart baby monitor provides you with clear real-time video and audio of your unattended baby.INFRARED NIGHT VISION & TEMPERATURE MONITORING- Rest assured knowing you can see your baby day and night, including overnight, with automatic night vision. Remote in-room temperature display lets you know your baby is comfortable and safe.ECO MODE & LONG BATTERY ENDURANCE- help you know how your baby's condition at the first time. The screen light turns off in silence and turns on when camera detects andy sound. You can do your housework freely.TEMPERATURE MONITORING- Monitor the room temperature of your baby all day long.Room temperature display. Easy to set up. You don't need Wifi, App, Battery. This video baby monitor includes lifelong professional technical support.